Location: On Clivo di Scauro, which is the same road as Via di San Paolo della Croce, 1/3 mile south of the Colosseum, 1/3 mile east from the Palatine Hill. Entrance is on Clivo di Scauro, in a doorway under the Basilica of Saints Giovanni and Paolo. 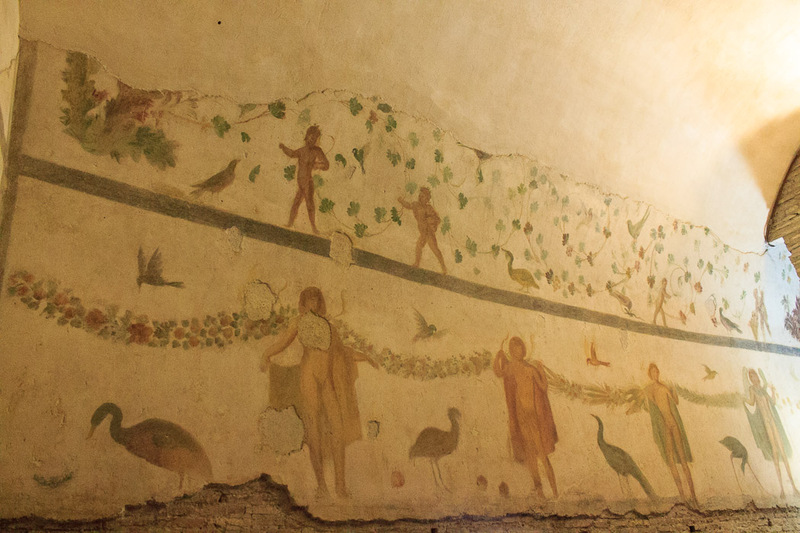 Case Romane del Celio is a Roman underground site where you can see 2nd and 3rd century Roman houses in which Christians worshipped, and several well-preserved frescoes. It is located under the church of Saints Giovanni and Paolo. It is probably easiest to get to by walking northeast (past the short edge of the Circus Maximus) from the Circo Massimo metro stop until you see a small pink building on the right, diagonally across the intersection once you've reached the end of that short edge of the Circus Maximus. By the way, this is a good opportunity to see the Circus Maximus, the Frangipane Tower and the Piazza di Porta Capena. Anyhow, once you see that small pink building at the east corner of Via di San Gregorio and Vid dei Cerchi, walk on the tiny Salita di San Gregorio which winds behind that building and takes a curve to the right, becoming Clivo di Scauro. After that curve, the second building on your left is the Basilica of Saints Giovanni and Paolo; look for the marked doorway which I recall being a few steps below street level. Alternately, you can walk across Via di San Gregorio from the entrance/exit of the Palatine Hill and walk up a short but steep embankment to get to Viale di Parco del Celio, which you should cross and continue on a few steps to that curve in Clivo di Scauro. 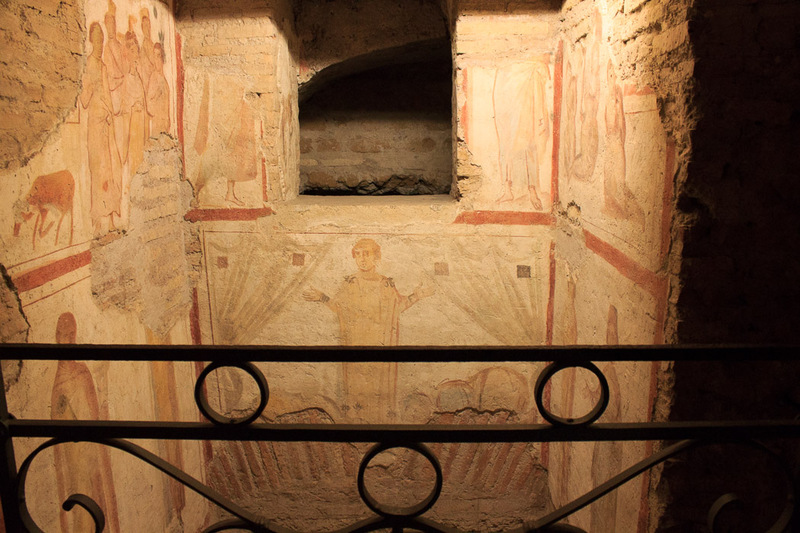 John and Paul (not the Apostles, and not the Beatles, but the guys the church was named after) lived in what are now the underground houses, which had been combined into an elegant pagan house during the 3rd century before they lived there. They were officers at the court of emperor Constantine (312 - 337 AD) who made Christianity legal in Rome. 24 years later, emperor Julian the Apostate (361 -363 AD) attempted to revert Rome back to paganism, and had John and Paul beheaded on the night of January 26th-27th, 361 AD after they refused to serve in a military campaign. They were buried on the site of their houses (which was illegal since this was within the city walls). A church was built over the houses in the 4th century shortly after their deaths, and remains of it can be seen in the present church which was built during the Middle Ages. The houses and their rich decorations were discovered under the church in 1887. According to reviews, a residence from the 2nd century AD, a single home of a wealthy family, and a 3rd-century-AD apartment building for artisans are all preserved in this site, but I must admit that the signage is poor enough (or my addled brain is old enough) that I had no idea when I visited the site that this was the case. 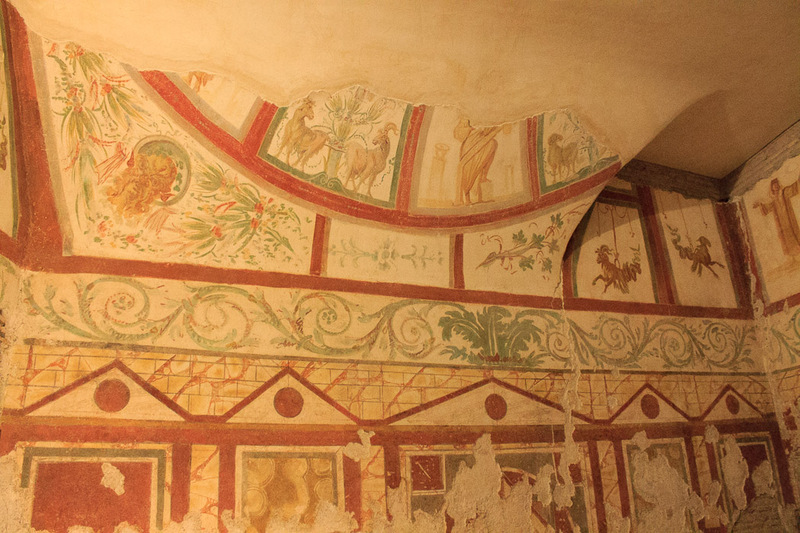 But the well-preserved frescoes are easy to see, even if they're not identified at the site, and they made the trip worthwhile. 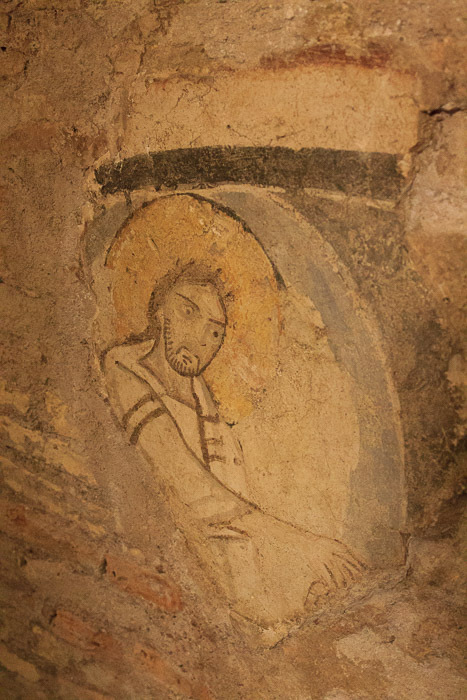 Those frescoes range from the 3rd to the 12th centuries. 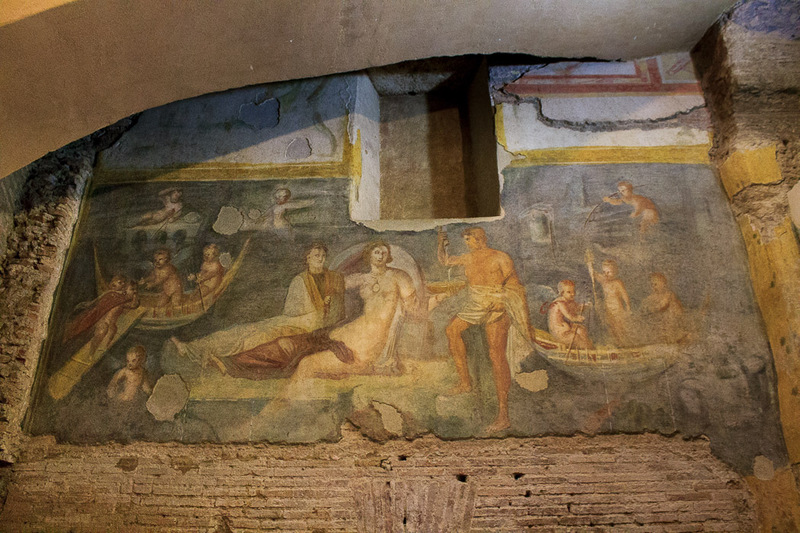 The most famous one is the 5th photo below, which is about 9 feet tall by 15 feet wide, and probably dates to the mid to late 3rd century AD. The subject of the painting might be Proserpina returning from the Underworld at the beginning of Spring, resting on a small island with her mother Ceres and her brother Bacchus. Or it might be Venus in her role as protectress of sailors. 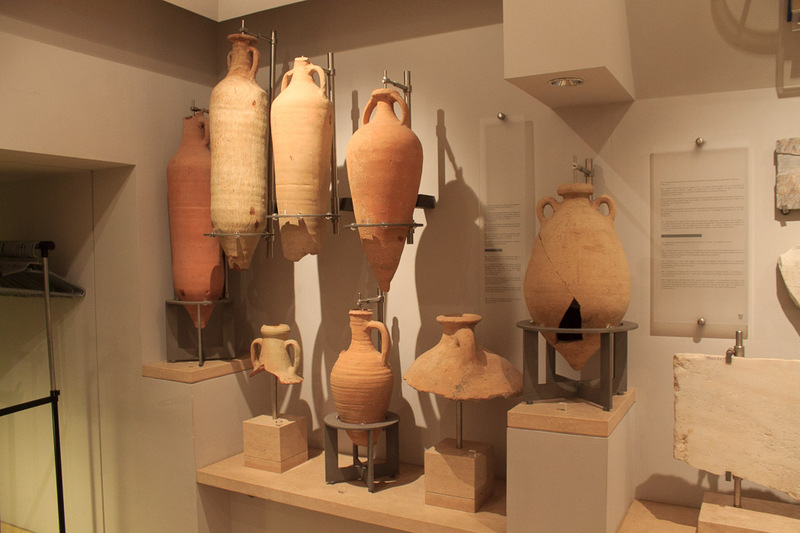 There is also a small museum (antiquarium) which houses many artifacts found during the excavation. If you get the idea that I think the site needs to be improved, explaining what you're looking at better, you're absolutely right. I think it's inexcusable to not use the money this site is collecting from all its tourists to invest in a few signs that explain what people are seeing. In 10 languages. It's practically free, for cryin' out loud. Get with it. Owners, go look at the underground at the nearly-free San Nicola in Carcere where the signs are not superb, but at least there's something. When you leave this site, there are four attractions just east of here that you might want to see. To get to them, continue on Clivo di Scauro in the same direction you were walking to get here, as it turns into Via di San Paolo della Croce. When you get to the major road, Via della Navicella, the Porta Caelimontana is right on your right, an arch of the Nerone Aqueduct is straight ahead, across the street, and the church of Santo Stefano Rotondo is behind the trees which are behind the Nerone Aqueduct arch. After you see these, walk south down Via della Navicella (away from the Colosseum) just a hundred yards to the entrance to Villa Celimontana, a small park in which you'll find the Mattei Obelisk. See all Case Romane del Celio photos.